The Finsbury Park/Stroud Green area should be more popular than it is. Next to a huge park with great transport links, the road is lined with decent, if not great, restaurants and has a number of excellent pubs tucked away in its back streets. It also has a number of new cafes dotted around the Tollington Park junction. 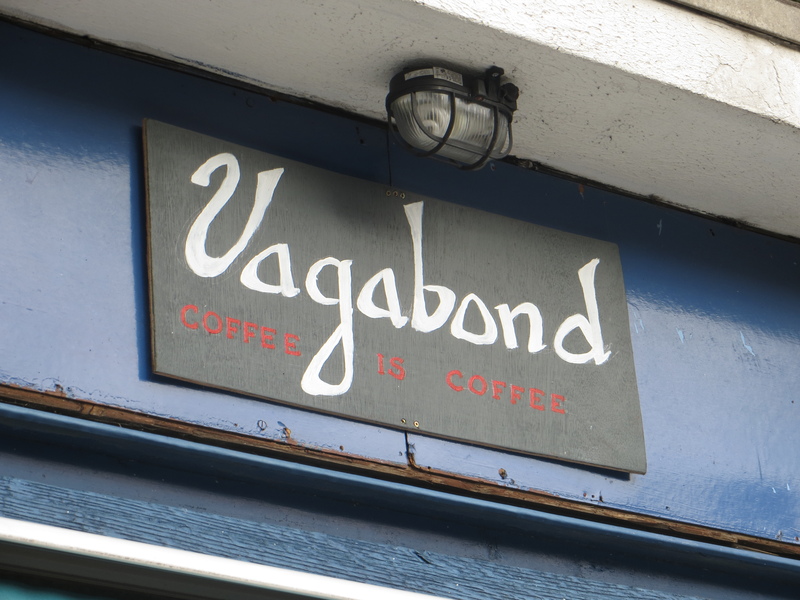 These include Vagabond Café, which has also just opened a second branch on another forgotten through road, Holloway Road. From the front it doesn’t look like much, tucked under the eaves of a council block, but inside is an excellent little café. A great coffee – thick and creamy with a punch of espresso. Brewed using Has Bean with an Ethiopian coffee, there are subtle nutty hints under the velvety froth. It’s a good size as well, though I’d like it a little warmer – but I feel I’m in an ever growing minority here. The menu offers espressos and a ‘Milky’ section – clearly a cheeky nod to the over milked coffees being served by chains. It was decently priced at £2.40. It manages to be part of the area while also aiming for better things. 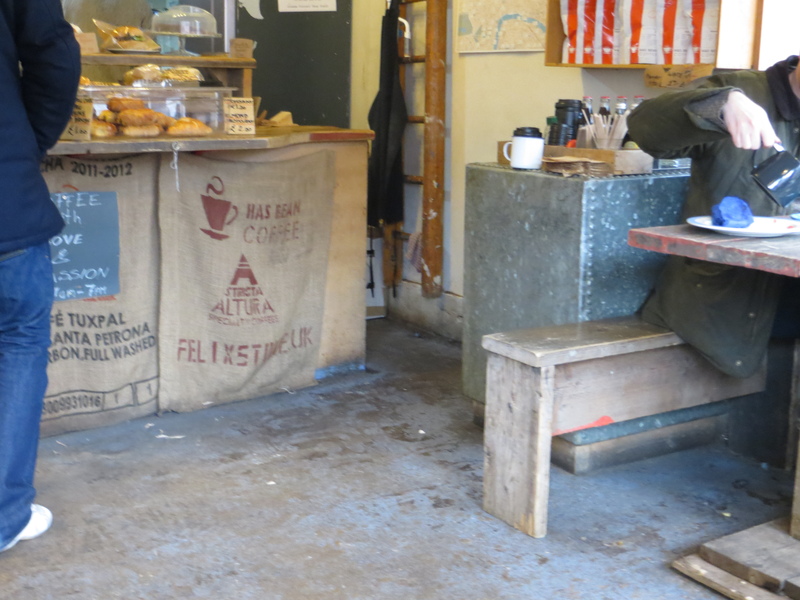 This funky interior is all recycled wood, old coffee sacks and industrial light fittings. The sign is painting onto a board of wood and hammered into the façade giving it a slightly temporary feel – but have no doubts, this place is here to stay. The small number of tables were filled with students and arty types on their laptops taking advantage of the free Wifi. A few tables outside were also manned by a few brave people – brave because of the cold weather and the almost over-bearing noise from the major cross roads the café sits nearby. 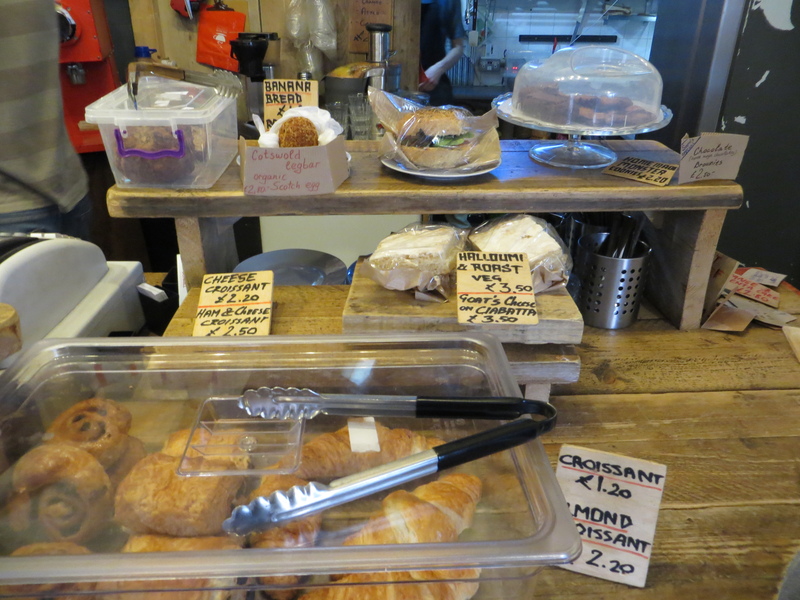 Some interesting baked goods and snacks including Scotch Eggs. I do wish more cafes would offer a bit of savoury finger food instead of just sweet treats. They also offer a basic breakfast menu, sandwiches and specials including Slow Pulled Pork and Beans. I’m probably being a bit mean as the service was excellent – however, it appears I arrived at shift change over and it took a bit too long for my coffee to arrive. 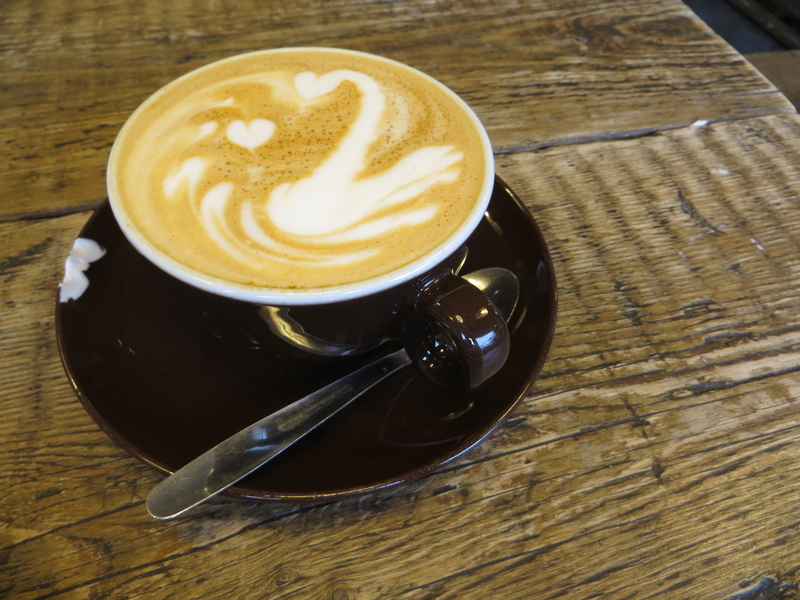 It did come with an apology and explanation, but in a café that small, with only maybe ten people to serve and three staff, you should never have to wait longer than it takes to froth your milk. The usual art and coffee cups are for sale here. It even has live music after hours. Both together would probably be enough to give it the full marks. However, what is worth an extra mention here is its ‘Pre-paid coffee’ scheme. I’m always going on about how cafes should engage with their community. Community doesn’t mean just those who can afford the art or have the free time to attend live music events. It is everyone. The pre-paid scheme offer works by someone buying an extra coffee and having it put aside for a homeless person to come in and collect. It’s a great idea, giving someone in need a little boost – and with coffee this good, it’s really is a treat. Well done guys! Don’t judge a book by its cover is the rule here. From the outside you’d barely know it was a café and the area, while full of potential, isn’t somewhere you’d expect a café of this quality. But this is a great little venue and I can’t wait to check out the Holloway Road branch. This really is the kind of place that could be the seed needed for a neighbourhood to bloom.